Welcome to the 2018-19 school year. I am very excited to be joining the Mary, Queen of Heaven family. That staff joins me in providing the best possible educational experience for your children and we look forward to celebrating their spiritual, academic, and social successes this year. The educational process takes effort on the part of the family as well as the school. This handbook has been developed as a framework in which our school can operate in an efficient and effective manner. The Mary, Queen of Heaven Parent/Student Handbook outlines the policies and procedures that make this possible. It is imperative that you are informed parents so that you and your children will have a better understanding of what is expected during the hours they are under the care of the school. Please read this handbook carefully. No handbook can address every situation or circumstance. Therefore, it is the right of the administration to make some decisions on an individual basis. 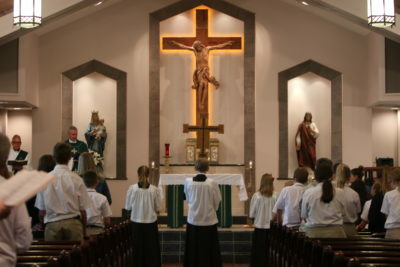 Please know that we take the responsibility of educating the students very seriously and will approach this vocation with dedication and constant prayerful reflection. We appreciate that you have entrusted us with your children, and we will work with you to bring about growth and success this school year. Thanks for joining me to help make Mary, Queen of Heaven the best school in our area!